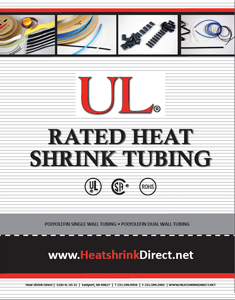 Heat Shrink Direct® stocks CSA/UL rated heat shrink in Eastport, Michigan. All products are produced at ISO/TS certified manufacturing factories. ROHS and REACH certifications are met. Many diameter sizes are on hand in 2:1, 3:1 and 4:1 shrink ratios. Both adhesive lined (dual wall) and non-adhesive lined (single wall) products are available. Black, clear and many various colors are stocked. The adhesive lined products come with the option of 4 foot sticks or on reels. The non-adhesive lined product comes in the reel format. Cut to specific length heat shrink is also a very common offering that will eliminate handling and labor for the end user. Heat Shrink Direct is known for very competitive pricing that can save your company a lot of money and increase that bottom line profit margin. Respectful customer service is a focus of the organization and taking care of the customer is the primary goal. Just some of the markets covered are OEM Automotive Wire Harness, RV, Marine, Agricultural Equipment, Appliance, Lighting, Commercial Wiring, Contract Wiring Houses and many more. Applications include wire splicing, Ultrasonic Welding coverage, Wire Harness Manufacturing, Automotive requirements, Farm Equipment, Off-Road Equipment, RVs, Terminal Strain relief, Moisture protection and more. Samples are available for product testing and approval. I was looking at the CB-1000-204 or 304 but i do not need mil-spec. I will be going through UL. at this point can be adhesive but does not have to be. ISO9001, ISO140001, TS16949, UL224, CSA, ROHS, REACH certifications all available upon request.